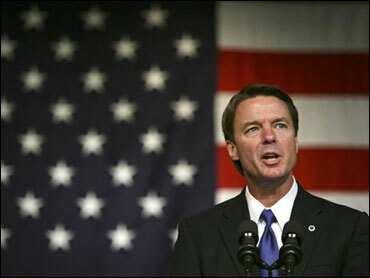 Democrat John Edwards on Friday released a plan he said would demand corporate responsibility, including limits on executive compensation packages and requirements that big businesses operate more openly. The presidential candidate said his plan would also restore retirement security for the middle class through tax reforms and savings help, allowing more people to put aside money and purchase stock from companies. He said those companies would perform better for regular workers under his proposed corporate reforms. "What does Washington do while corporate profits climb and the wealth of the very wealthiest grows - all at the expense of the vast majority of hardworking Americans? It circles the wagons around the people who are already doing the best," Edwards said in remarks prepared for delivery that were provided to The Associated Press. "Instead of protecting the compact of equal opportunity and shared prosperity, Washington protects corporate profits and hoards prosperity." Require corporations to disclose lobbying activities, political contributions, environmental impacts and government contracts and subsidies. Give shareholders new rights regarding corporate governance, allowing them more say in decisions such as executive compensation. Protect consumers from abusive financial products, such as high-cost mortgages and lines of credit, and payday loans. Modernize labor laws to help workers join unions and bargain for better pay and benefits. Create universal retirement accounts that would require employers to offer savings plans for workers who can't access pensions. The former North Carolina senator said it's important to force companies to honor their pension promises. In recent years, he said, about two-thirds of companies have frozen their plans, and many workers are seeing cutbacks in their pensions. Companies also should not be allowed to classify workers as contractors to avoid paying them benefits, Edwards said. Edwards, who wants to mandate universal health care, said businesses should be required to provide coverage for their workers, or help them purchase coverage.